Our Events: Hattie Ham’s 1st Birthday — Everybody's Invited! This past weekend, Everybody’s Invited! put on our pig-eared party hats to celebrate Hattie’s 1st birthday. This party was near and dear to our hearts; Chris, Hannah, and I have watched Hattie grow from a tiny shrimpy to a toddling, lion-roaring little lady. I can’t believe our sweet little Hattie is already one! The piglet of the party! The birthday girl in her pretty piggy party dress. One of Hattie’s nicknames is “Hattie Ham,” so we built on this with a ham and pig-themed party design that was bright, colorful, quirky, and a little bit retro. On the menu: pigs in a blanket, pig-shaped ham and cheese sandwiches (vegetarian options too! ), spicy caramel bacon popcorn, BLT chips, bacon strips, “pig in the mud” pudding cups, marshmallow snout pops, and pig treats (better known as gumballs). The feeding trough (minus the bacon, which was cookin’!). Pigs in a blanket and pig-shaped sandwiches. “Pig in the Mud” pudding cups – chocolate fudge pudding with pink, pig-shaped sugar cookies on top. “Snout Pops” – pink marshmallows dipped in pink candy melts and topped with chocolate chip nostrils. The centerpiece of the party was an amazing ham cake made by Bliss Bake Shop in Portland, Oregon. A highlight of the party was Hattie’s daddy’s performance of an original kids’ song on the guitar. It was such a sweet moment! Hattie’s daddy breaking into the “Kindie-rock” scene with a special song he wrote for his baby girl about being different. Getting ready to pig out on her first bites of birthday cake. “Hammy Birthday!” banner by Everybody’s Invited. Above the fireplace – pig snouts, a pig-ear party hat, and a framed vintage ham advertisement. Party like a pig! Pig snouts, spicy caramel bacon popcorn, BLT chips, and a personalized “Hattie Ham, Here I Am” book for Hattie. Each paper cup had a pig snout on the bottom – a funny surprise to guests. Bacon Maple Ale tasting (none for the mini guests, of course!). 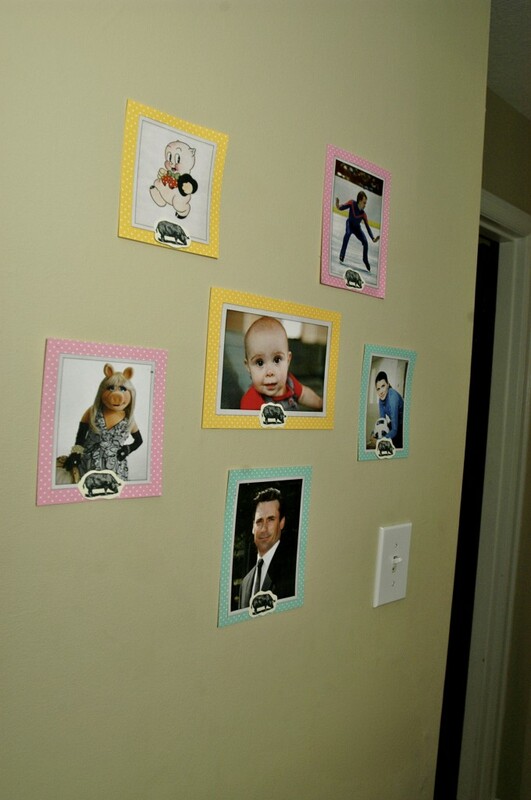 “Famous Hams” wall – Scott Hamilton, Porky Pig, Mia Hamm, Jon Hamm, Miss Piggy, and our very own Hattie Ham. “Mom, is that you?” A guest and her piglets in the Hambooth. 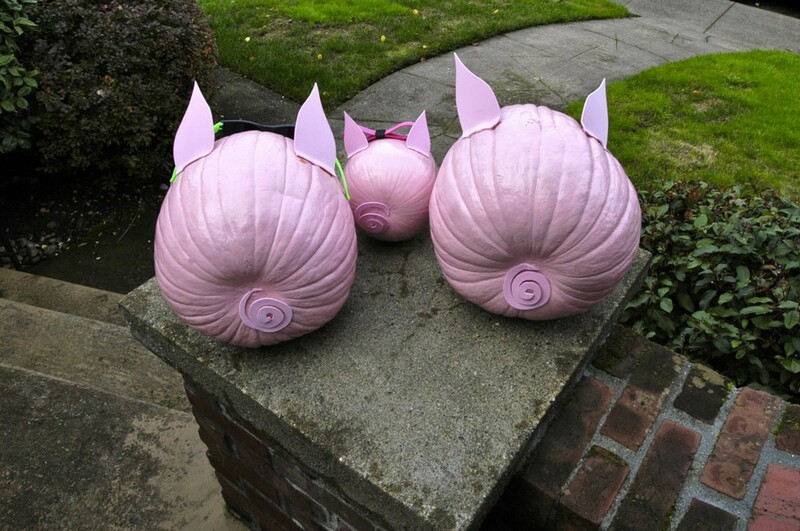 Pig pumpkins greeted guests on the front porch. We hope you had a Hammy Birthday, Hattie! Thank you for letting us be part of your special day! You can also see our original Hattie Ham inspiration board on Pinterest.